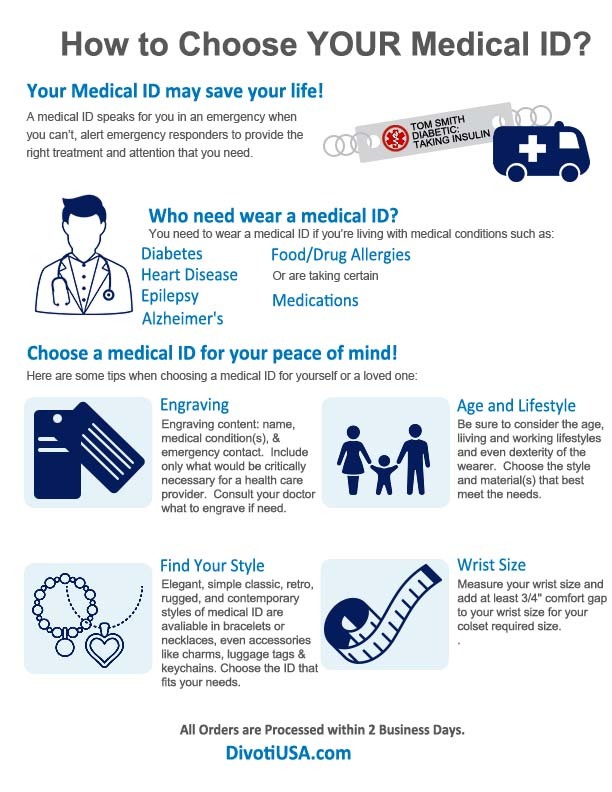 A medical ID speaks for you when you can’t. It is the most important piece of jewelry you wear. Good looking is a must as it is a piece of jewelry, but there is much more to medical alert ID pieces. EMS Personnel are trained to look around the neck and the wrists for medical ID jewelry, so you should choose between a bracelet or a necklace. Generally, we recommend bracelets over necklaces, as bracelets are more visible and do not pose a suffocation hazard if they get caught, as a necklace can. However, pendant necklaces provide a larger engraving area, and some people do need them. Please choose a necklace with longer length as it is easier to break away. We also make Medical ID accessories like key chains. We must inform you, though, that they are accessories to add on and shouldn’t be counted on to act alone. Jewelry for wrists comes in different types and materials, including solid links, chain links, open cuffs, bangles, and wristbands. If you are a ceramic artist with a medical condition, for example, the open cuff may be one of the best choices to wear 24/7, as your hands move frequently and differently. We offer the most comprehensive collections of medical IDs. Please consider what you need and choose the one that best fits your lifestyle. No matter what style you choose, it should always have a break-away point. If your jewelry gets caught on something, it allows you to break free without getting hurt or suffocated. Medical ID jewelry is the product of applied science. There are a few correlated factors that affect the durability and performance of your medical IDs. Stainless steel offers excellent corrosion resistance. One concern with stainless steel is its nickel content, which can cause allergy. The nickel gives the corrosion resistance to the alloy. When there is sufficient nickel content inside the alloy, acidic human sweat cannot dissolve the nickel out from the alloy. Of course, titanium excels over stainless steel in corrosion resistance. It is lightweight, nickel free and resists strong acid and alkaline. It is also more hypoallergenic than stainless steel. Custom Engraved medical IDs provide emergency medical information when you need it the most. During this type of medical emergency, time is the first and foremost priority. It is not a good idea to overload the EMT with all information from your medical profile. Please organize and put down only the most critical information. We recommend consulting with your doctor about your engraving content. Accuracy, Speed, and Directness are key. We offer the most comprehensive collections of medical ID jewelry for you to choose from, with a full range of different designs and styles to best fit your needs. Moreover, all of our medical IDs come standard with black fiber laser engraving at no cost. Divoti is affordable safety in style.